Bonjour lecteurs! What a beautiful week we had! Nothing better than some hot sunny days! Let’s hope the weekend stays like that! Now, time to read our weekly fashion post. Today Baba Fashionista with XOKiddo presents you with a very smart brand. Plus we give you a chance to win the same top as Baba! Happy Friday lecteurs! Let’s not wait further and show you the beautiful items we received from XOKiddo! And don’t forget to enter the GIVEAWAY at the end. After all, it’s been a while since we had one on the blog! 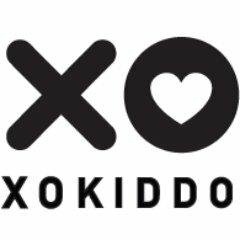 XOKiddo is a trendy yet timeless, organic children’s fashion label for the cool kids created by Rona Hollows. Based in London, Rona designed herself all the clothes. The collection consists of beautiful, unisex, quality basics that are contemporary yet timeless and super practical. These basics are complemented with seasonal pieces that are more akin to the experimental and quirky characteristics of Dutch design. 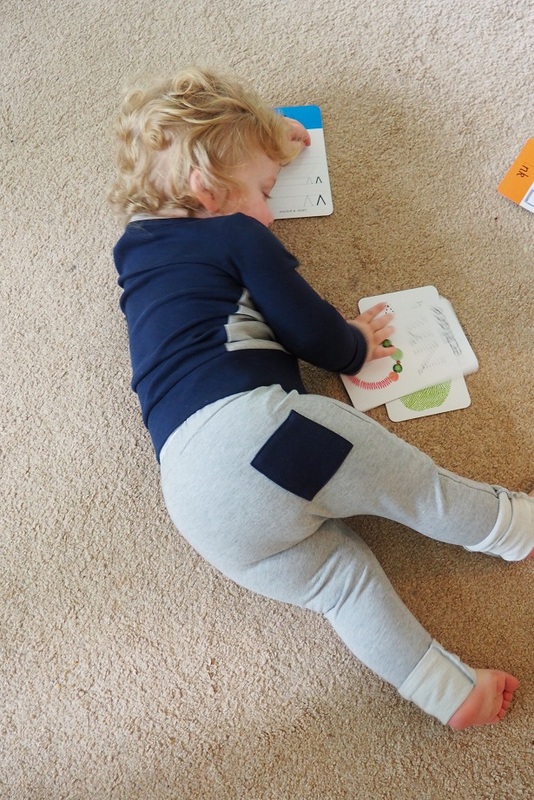 So another mum entrepreneur taking part in our childrenswear’s series! XOKiddo uses a lot of bold and contrasting colours. The colour palette focuses on black, white and grey with pops of bright orange. The label also has a minimalistic approach to design that makes XOKiddo undeniably Dutch (Rona is from the Netherlands). 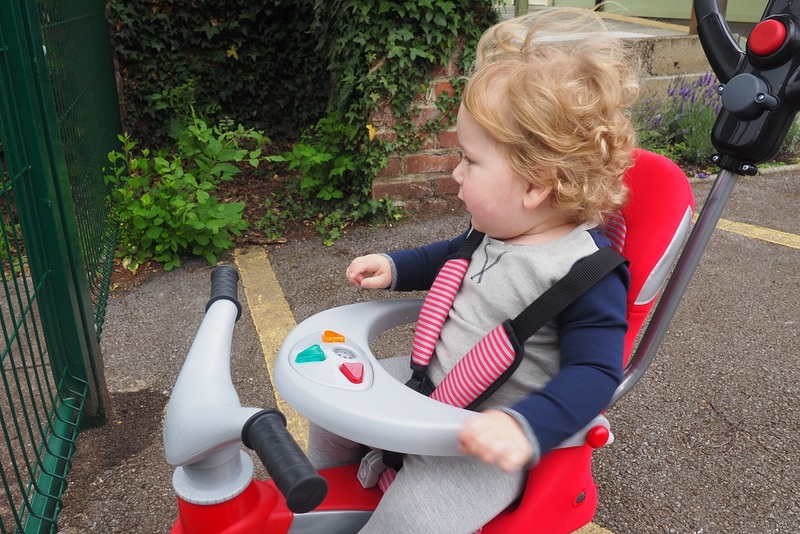 While the brand is based in the UK, it is nice to feature une maman européenne like me! Last but not least, XOKiddo has recently had very good news. 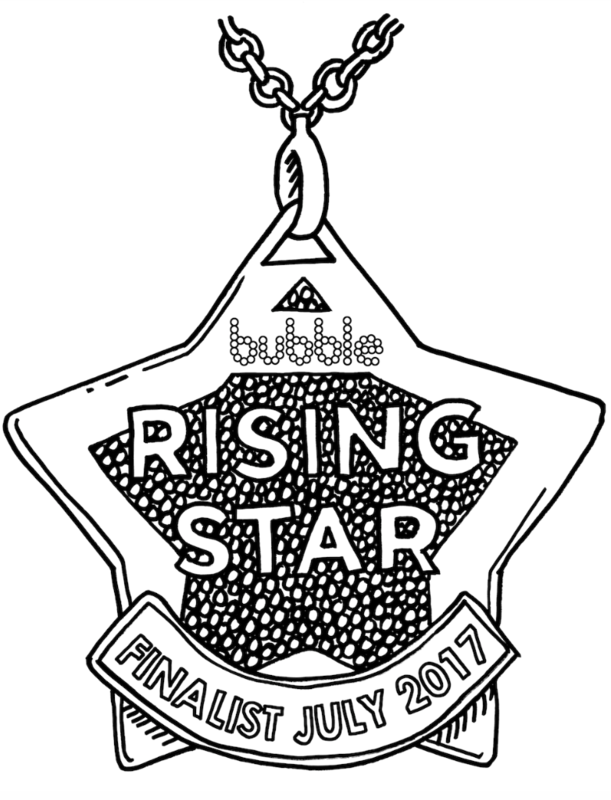 The label is one of the finalists for the Rising Star Award at the gorgeous Bubble London taking place next weekend! We are so excited about la nouvelle and we hope that XOKiddo will be the lucky winner! So happy for this fab label! We received two items for this review. Time to tell you what we made of them! Following the colour palette, these grey trousers are super comfy to wear! Made of 85% cotton 10% polyester and 5% spandex, they have a very nice fit. Baba is a strong boy with muscly legs. Yet, he looks really nice and svelte while wearing them! We teamed them up with a bright orange body and these two pieces of clothing were perfect together! Check me out… Feeling super fab! 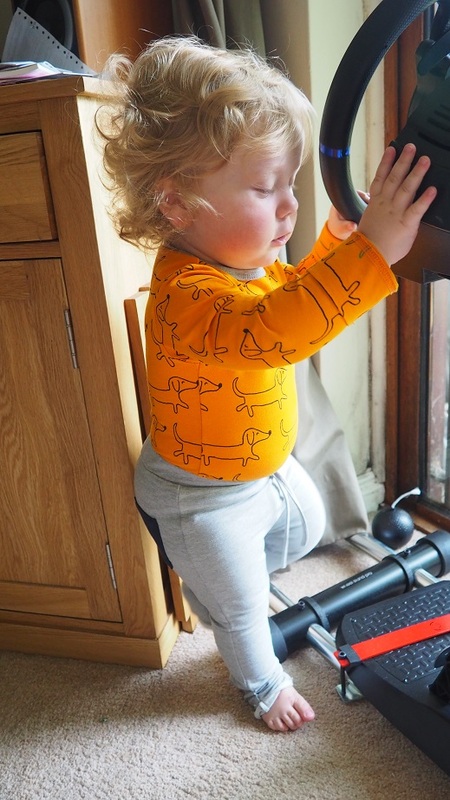 The mix of organic cotton and robust and durable polyester and spandex makes this outfit both comfy and easy to wash. Plus the quality is obvious straight away. Baba already wore them a couple of times and it looks as new as the first day! Fabuleux! We will keep them for bébé numéro 2! I love the cute detail at the back, the blue square. J’adore the bottom of the trousers that just look cool and trendy! A bum shot was necessary! Baba was more than happy to oblige! The brand also offers a colour block long sleeves top in dark blue. As we received the matching set, let’s see now what we made of the top! Ce t-shirt is parfait to go with the first garment we described. 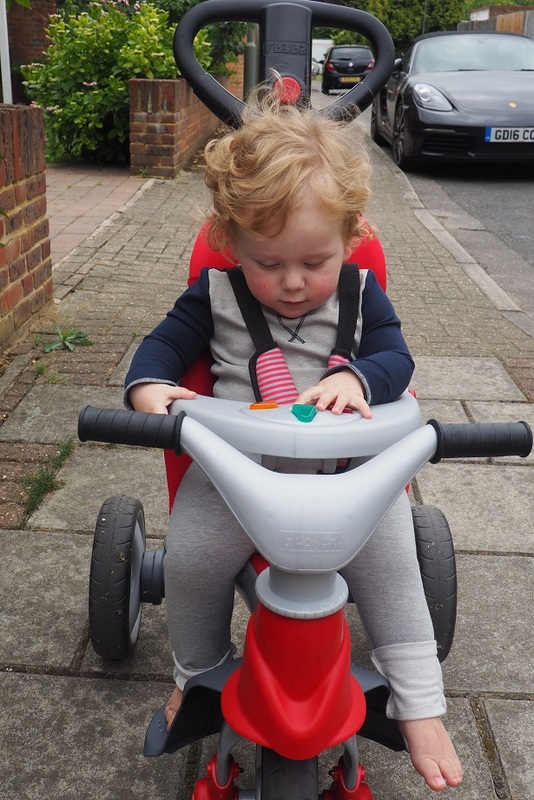 Let’s go for a ride and show off my fab outfit! Also made of organic cotton, this outfit is very simple, yet smart and comfy. I love the combination of blue and grey. It makes it the perfect top for Summer but also later on when it’s getting cooler! I don’t know about you but j’adore buying clothes in bleu. It’s so elegant and a great substitute to black. En plus, the overlock stitch detail in the neck gives the top a contemporary look. Baba looks very smart and yet a bit sporty! I love it! The full look with the matching set is definitely the best, but I am sure we will be wearing both items separately with other clothes from Baba’s wardrobe! Minimalism and practicality are key for XOKiddo and we love it! The label only uses the best organic fabrics to ensure a great fit. Your little one is comfy and looks undoubtedly cool! Comfort and durability are the best words to describe this great London based brand. No fuss no frill but beautiful bold colours and great designs make XOKiddo a must-have for any child aged 1-5! A happy face while wearing some cute clothes! We love it! 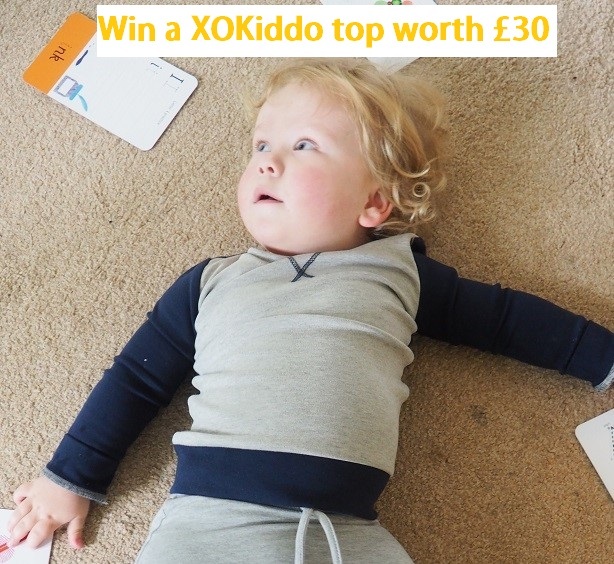 And because XOKiddo is such a great brand, we are very proud to team up with them and offer you today the chance to win a Colour block Long sleeve t-shirt! 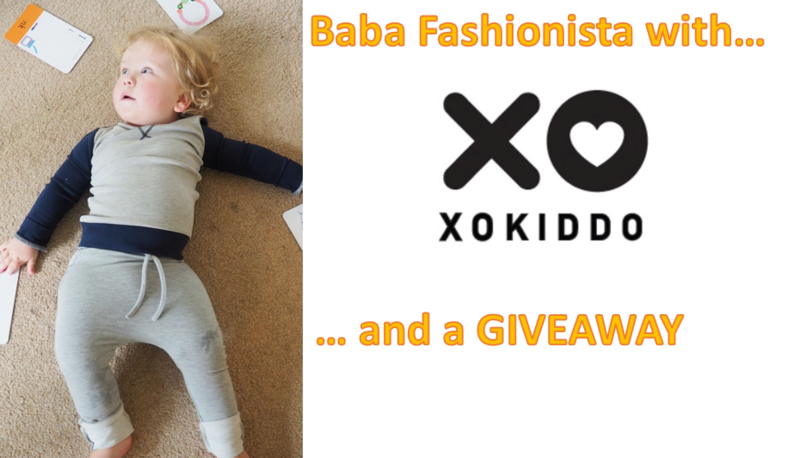 Baba Fashionista with XOKiddo – GIVEAWAY! Do you love clothes that are absolutely gorgeous? So gorgeous you want to keep them forever? Do you like bold and fun clothes for your little ones? Then you need this top from XOKiddo! Look how content is Baba while he is wearing it! It’s your lucky day as we teamed up with this gorgeous brand. One lucky Frenchie readers will have the chance to win one Colour block Long sleeve t-shirt! It’s worth £30, but more importantly, it’s gorgeous and your little ones want it in their wardrobe ASAP! If you are after a new colourful and ethical item, enter our GIVEAWAY now via Gleam! There will be only one winner! This giveaway starts on Friday 7th July at 7 pm and ends at midnight on Monday 7th August 2017 at midnight. The closing date is 11:59 pm on Monday 7th August 2017 at midnight. Provision of the prize is the responsibility of XOKiddo. Disclosure: we received these clothes in exchange for an honest review. Who would not love those!? They are just fab! Looks like a gorgeous brand. This looks fantastic, thanks for the opportunity. What a lovely top – this looks like really good quality. Looks like a lovely top; thank you for the chance to win. Great Review. Thank you for running such a lovely giveaway! The clothing range is absolutely gorgeous! 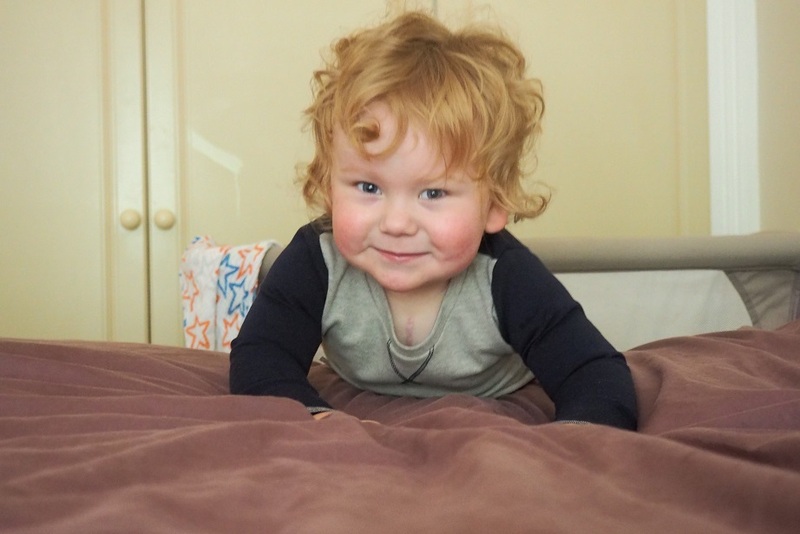 So different to many of toddler clothes available on the high street! This top would really suit my nine month old nephew. Previous Previous post: How to have the best camping holiday this Summer – 5 Frenchie tips!